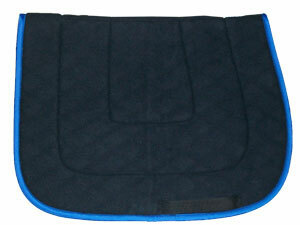 All of our Schooling Pads are customizable! 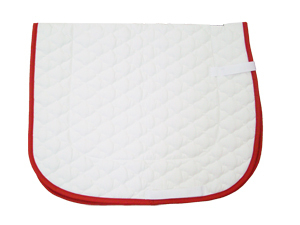 Available in All Purpose (Horse), Pony, Oversize, and Dressage sizes; your choice of contoured or straight spine; and single or double trim. Billet straps, girth straps, and/or gripper patches available upon request unless otherwise stated in product description. Click Here to see the color combinations and standard sizes for each cut we offer. 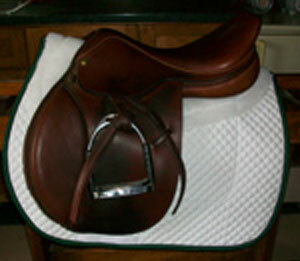 Broadcloth quilted on both sides over 1/4"poly fiber fill. 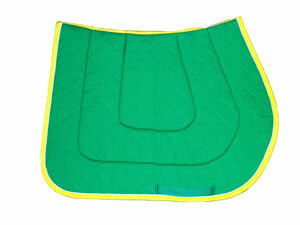 One of our more popular products for horse show prizes, monogramming, or personalizing to match barn colors. Check out our Colors Available page to see the variety of body, trim, and piping choices that we offer. This pad is two-in-one! A contoured spine Style #17Q or #19 (your choice!) 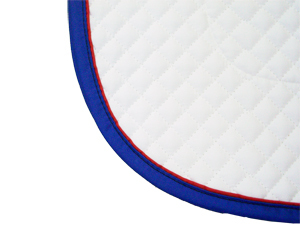 is combined with a 1/2" thick halfpad to give extra cushioning where it's needed most. 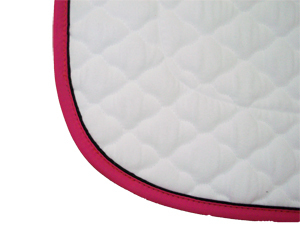 Every pad comes with girth straps and double trim and is machine washable and dryer safe. Developed with assistance from So Southern. Your choice of trim, piping, and body color. The Royale - Now in Color! 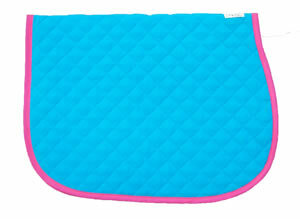 Our two-in-one pad is also available in colors! 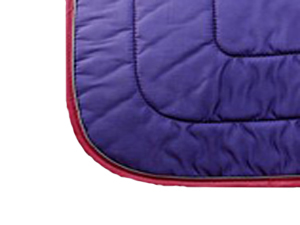 Choose your body and trim colors to personalize your soon-to-be favorite pad. 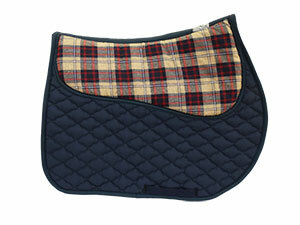 Our hit two-in-one pad gets a fun new twist with plaid or novelty prints! 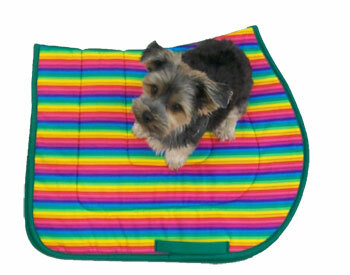 Check our Novelty and Plaid pad page to see what prints are in stock. 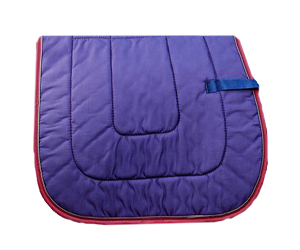 This pad features a quilted top and bottom and is machine washable and dryer safe. 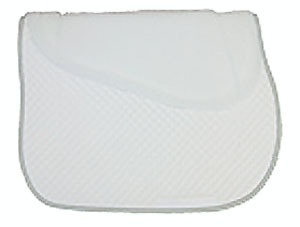 All pads come with underside gripper patches and girth loops. Available in your choice of body, trim, and piping color combination. Check to see Colors Available. 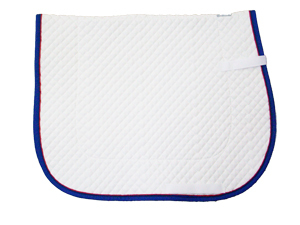 A square small diamond quilted pad with a white, black, or navy cotton broadcloth top. 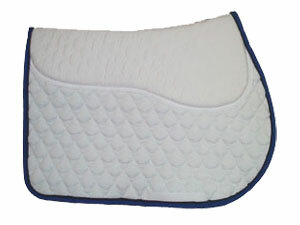 It's quilted over 1/2" foam and a poly fiber fill with 100% cotton flannel against the horse. 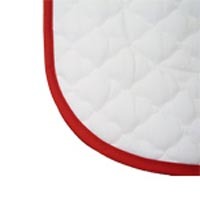 White broadcloth top and 100% cotton flannel bottom quilted over a 1/2" foam center. White or Black body color. Your choice of trim color. 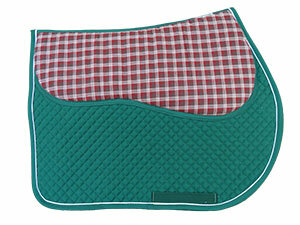 "Colors" saddle pad with a colored broadcloth top and a 100% cotton quilted flannel bottom. Available in your choice of body and trim colors. 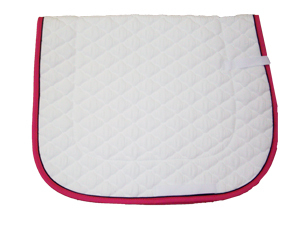 100% cotton flannel quilted on top and bottom with a 1/2" foam center. White body. Your choice of trim color. See the Fun Pads page for the current patterns available. 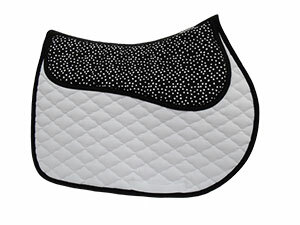 A Small diamond quilt pad with extra foam under the saddle; girth straps and gripper patches are strategically placed to help keep the pad in place. 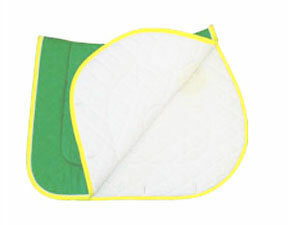 This Pad is machine washable and dryer safe. You pick the trim and piping. 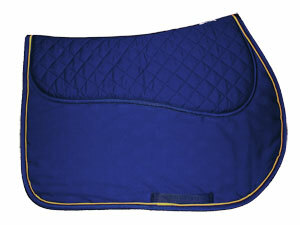 A Polar fleece top over 100% cotton quilted flannel. Your choice of body and trim colors.